Bears use trails with motorized recreation less often than those without it, new University of Alberta research shows. "We had expected bears to leave areas where there was motorized activity altogether, but that wasn't the case," said Andrew Ladle, recent graduate and lead author on the study. "Instead, we found that the bears are still in the area and simply using these trails less frequently." The study is the first to directly link bear activity and recreational activity on trails, rather than on roads. 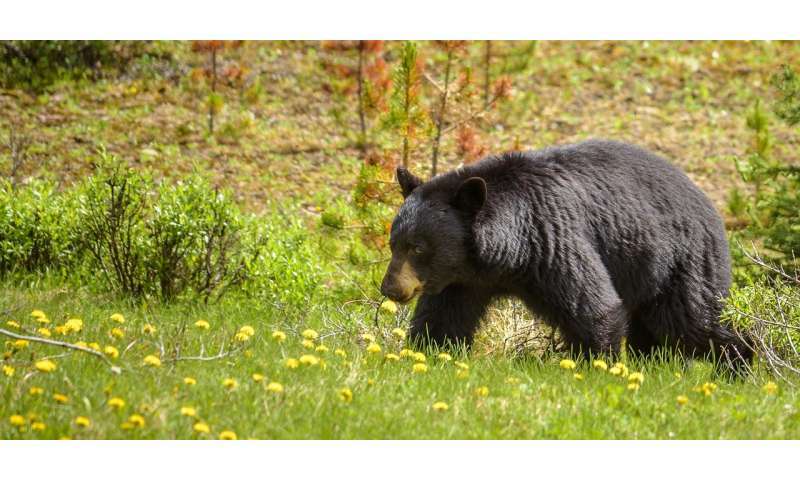 Using trail camera data in 192 locations in and adjacent to Jasper National Park, the authors documented occurrence and intensity of use of grizzly bears and black bears as well as recreational activity with and without motorized vehicles. They found that, although grizzly bears and black bears kept their distance from one another, they still used trails shared by motorized recreation, like ATVs and dirt bikes, but less frequently. "Many of these trails provide rich food sources for bears, so if they are using them less frequently, they may have decreased access to high-quality food," explained Ladle, who works with Mark Boyce, professor in the Department of Biological Sciences. Avoidance behaviour can also be associated with increased stress for bears, which is related to survival and reproduction. This study adds to the evidence that motorized recreation has a negative impact on bears. The researchers used a new method of analyzing the trail camera data, adding a measurement of frequency, rather than just occupancy. The approach provides a more accurate picture of animal activity in the area. Ladle also employed a multi-species analysis, treating both bears and recreation as species. This approach collected data on different subjects, such as bears, and how their presence interacted with other species, such as motorized recreation, giving more context and improving the researcher's understanding. "Older methods of analyzing trail camera images do not take full advantage of the data," explained Boyce, co-author on the story. "This new approach will have many applications for ecological research." The paper, "The Role of Human Outdoor Recreation in Shaping Patterns of Grizzly Bear-Black Bear Co-occurrence," is published in PLOS ONE.